I layered Black, Pumpkin Pie and a sheet from the Nite Owl ds. The floating Black layer was run through the Big Shot in the Spider Web Textured Impressions folder. I love the designs of the Nite Owl ds, but I've found that the cut edges are very, very white and ragged looking. The edges need to be sponged -- usually with Black. 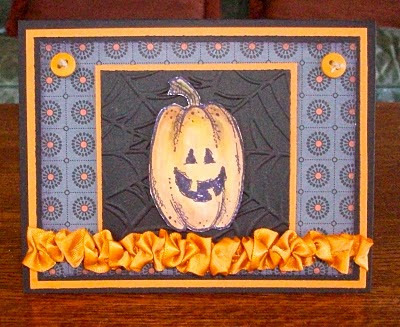 What a beautiful jack-o-lantern card. I love your layout and the ruffled ribbon looks perfect! Now how cute is this!! Love the added ribbon and how you ruffled!